From 12 to 18 December, very soon after the Polish adventure, I went to Taiwan with my partner Ernst van Alphen to participate in a conference and give lectures and seminars. 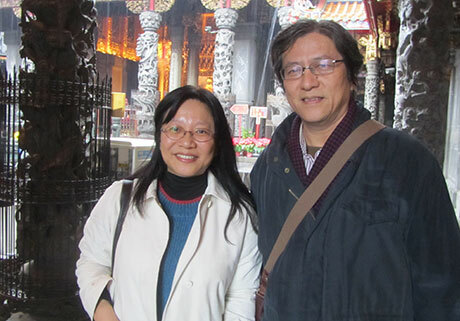 I found a former PhD student from over 20 years ago, Vinya Huang, enjoyed a city and country I had never visited before, and encountered very active students and faculty interested in visual culture. Our hostess, Jui-Ch’i Liu, chair of the Graduate Program in Visual Culture and organizer of the conference, and her partner Daiwie Fu, dean of the faculty of humanities and Social Sciences, took us on touristic trips, elaborate dinners, and other wonderfully exhausting and fulfilling events. One such event was a visit to a temple where what they called a folk religion is alive and kicking. The buildings suffered from horror vacui, so much so that the rare spots that were not (yet) carved, painted or filled with mosaics stood out like a sore tooth. The temple has been, still is, and will always remain under restoration; as alive, changing and full of people as the religion itself, the city, and the country. 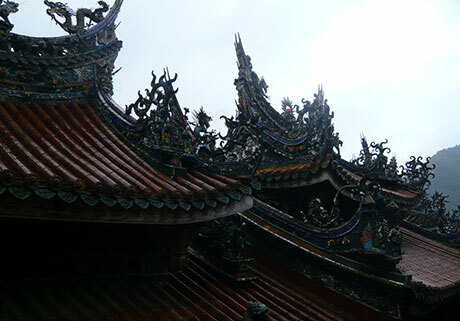 For me, this is a good example of what is perhaps best called contemporary Taiwanese baroque. Unfortunately, it was raining almost all the time. 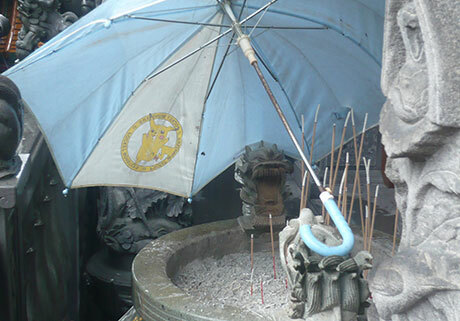 Even the burning incense sticks needed the protection of an umbrella. Here, one decorated with a Japanese monster from comic strips. That is visual culture for you! It also demonstrates that the temple is not a mere touristic site; it really is alive. 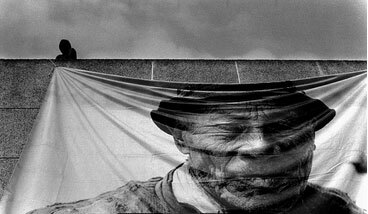 The conference was devoted to the theme of Performativity of Visual Culture. I spoke about the performative look as a motor of narrative, showing during the talk the combined clips of scene 1 of Madame B so as to enforce on the audience the constant need to choose which, as was my argument, defines the realm of visual culture. The last day we gave a seminar together, under the heading of “Semiotics and Visual Culture”. The vibrant active minds of the students, who asked us questions for hours, was a fantastic bonus. Then, as a big surprise, in the afternoon, both Vinia Huang and Ruth Hu, who spent last year in the Netherlands finishing her dissertation and who works in the Taipei Fine Arts museum, took us out to see a brilliant exhibition there, of photographs by Chao-Tang Chang. Very inspiring for the idea of (in)visibility that was still on my mind from the previous day. I decided to write on the show for Art in America. During a week of hard work I have learned how complex and difficult it is to install a video exhibition. The week flew by; I didn’t find a minute to report on it. On Friday the 6th, the opening, preceded by a guided tour for “friends of the Muzeum Sztuki”, took place. It was a totally overwhelming experience. Many people came for the tour, and were clearly very interested. Many stayed for hours. 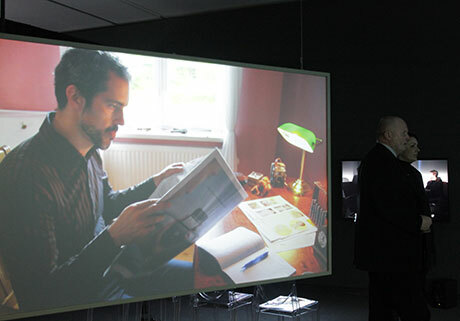 We had installed the works for maximum “immersive” effect: apart from the first work, two opposing screens with back projection, they were hung low, with seating provided. It did have the desired effect. Our co-producer and actress Mervi Appel had come from Åland, to learn about the works. She is curating the next full exhibition of the project, in the Post and Customs House in Eckerö, on the Northern coast of the island. This will be very special; some scenes were filmed in that very house. This building is now a cultural Center, and Mervi is its director. Christopher Wessels, our cinematographer, was also able to come, and my old friend Ydessa Hendeles, a unique collector-curator now artist, and her partner David Goldberg, came all the way from Toronto. This was incredibly heart-warming. For more, just revert to the Exhibitions section, Madame B. This week we also contributed a poster and a short video to Walid Raad’s web series of weekly posters in protest of the deplorable conditions under which the new prestigious art venues in the Gulf region are being built by migrant workers exploited and abused. Please join Walid’s campaign gulf labor.